Economize R$ 29,44 (30 %). Comprar eBook Kindle. Feeling directionless, or perhaps too intimidated to make a necessary change in your life? Tired of letting your fears keep you from achieving your goals or becoming healthier, happier, or more successful? If so, this book is for you. Popular life coach and consultant Adam Smith has created a powerful method to help you harness your inner passion and drive to overcome whatever is holding you back. The Bravest You presents the five-step Bravery Process™, an easy and highly effective way to master our biggest fears. Offering inspiring and helpful advice, Smith guides you through each of stage of the process—Complacency, Inspiration, Fear, Passion, Bravery—showing how to identify goals and passions and apply the Bravery Process to any circumstance. These proven techniques will empower you to conquer your doubts once and for all and become your bravest self. Covering the ten most common fears all successful people face, from the fears of inadequacy and being judged, to rejection, failure, loss of control, and loneliness, The Bravest You arms you with the necessary tools to tackle any fear-inducing situation head-on and lead the braver, happier, and more successful life you’ve always imagined. Comece a ler The Bravest You no seu Kindle em menos de um minuto. ADAM KIRK SMITH is an entrepreneur, life coach, consultant, and public speaker. His popular blog, asmithblog.com, offers insights on leadership, bravery, and life purpose, among other topics. Named one of the most influential people of 2014 by American Genius, Smith has written for Entrepreneur and Success Magazine, among other publications, and has been featured in Newsday and other media. He lives in Illinois with his family. At some point—present or past—fear has torn us all away from some significant accomplishment or victory. You can probably think back to a moment in life where you avoided it, suppressed it, or hid it. If your experience is anything like mine, I know that none of these reactions helped you achieve anything. Instead, you found yourself further away from what you wanted to accomplish and more frustrated than ever before. But you don’t have to keep running from fear. In fact, there’s a way to overcome and eradicate each and every fear you face. Let me introduce you to the five-step bravery process I have created to help people fight the ten biggest fears we all face. The diagram below outlines its specific steps—or stages—which everyone moves through in their quest to unlock an extraordinary life: complacency, inspiration, fear, passion, and bravery. Note that you start off at a low and flat point of complacency or the “playing it safe” stage, before an inspiration or idea strikes that spurs you to want to make a positive change. Often this is also the point at which one or many of the common fears we’ll explore in this book sets in. You may find yourself asking questions like “What if I fail or am rejected?” “What if I’m not up to the challenge?” “What if it’s the wrong decision or it ends up hurting my future or those around me?” These or unexpected obstacles can easily send you back into the valley of doubt and fear. But as I will show you in each chapter, you can harness the power of your passion and drive to overcome any fears or mental blocks that are stalling your progress toward achieving your dream. And eventually that leads to the final step of the process, bravery, where you emerge stronger and more courageous and confident than before. In undergoing this journey, you eventually move to a higher and much happier point in your life and toward the bravest version of yourself. It’s important to point out as well that I’ve placed the five stages of the process in this order because it is the order in which most people whom I have worked with as a successful business consultant and life coach—and many I interviewed for this book—have experienced them. I underwent them in this order as well. However, you may find that you go through them in a different sequence, perhaps with an idea or inspiration sparking your bravery process and then fear or complacency settling in until something kindles your passion and drives you to take the leap to achieve your goal. The order in which you undergo the stages doesn’t matter as long as you keep moving toward the end goal, which is developing the courage to pursue what you want and live the life you’ve dreamed of. Along the way, you will be reminded of why you started climbing in the first place, and you will be forced to make the most important decision of your life, possibly more than once: choosing whether to give in to fear or fight it and climb onward toward bravery. This book will help you power through your own bravery journey, so the critical first step is to identify where you currently are in the process. Let’s start by exploring complacency, and then we’ll move to finding ideas that are big enough to pursue and passion for them that is strong enough to carry you through to bravery. If you know anything about car racing, or sports for that matter, then you have probably heard of NASCAR driving legend Richard Petty. Many people remember him for his Charlie 1 Horse cowboy hat and trademark sunglasses, but he’s best known for winning the Daytona 500 seven times. Something happened in the 1970s that sent his winning streak into a tailspin, though. His opponents changed with the times and updated their cars, but instead of doing the same, Petty was complacent. When asked how things changed so drastically, he answered: “We’d been winning steadily for twenty years and decided we wouldn’t change.” Petty played it safe, and as a result he didn’t have one win in the last eight years of his career. Not one. Complacency and/or “playing it safe” are silent enemies that can tell us all the reasons why we don’t need to keep pressing forward and become better. This concept doesn’t just apply to sports—it can stall any aspect of life or business. As I mentioned earlier, I played it safe for such a long time that once I got an idea, I never looked back, but for many, the idea comes first in the bravery process, and complacency follows suit. Again, keep an eye out for this during your bravery journey. If the word “complacent” comes to mind when you think about yourself, then you need to begin by asking yourself this two-point question: “How much is living a great life worth to me, and can I afford to not become better?” Your answers will give you your much-needed reason to begin moving away from complacency and toward bravery right now. So what does “playing it safe” or “being complacent” look like? One way that people play it safe is by using their full schedules as a reason for why they aren’t pursuing more of their life’s dreams. As life becomes busy, we become attuned to the rhythm of monotony, and the easy thing to do is to let time get away from us. Chances are that a lack of time is the reason you fall back into this false sense of security and aren’t adding more value to the world around you. This is why you will see many ideas around the subject of time in this book—our fears and our amount of available time are related in many instances. I get it. You are busy. But maybe your busy life is your crutch: you keep saying yes to things that don’t matter, and that is what keeps you in the safe zone. The problem is, life just keeps getting busier, and our crazy schedules will keep us stuck in a boring, safe routine. “Oh, my boss wants me to work such long hours that I only get four hours of sleep a night and barely see my family.” Sure, gotta become a workaholic to make money and get it all done—right? Maybe you know what I’m talking about. If we’re not careful, other people, or outside forces with their own agendas, will recruit us as their puppets. When we find ourselves letting everyone else dictate what we do and how we use our lives, we miss out on vital opportunities to succeed, grow, and feel fulfilled, ultimately leading to complacency. I know you don’t want to give busyness the upper hand and bury the chance of moving forward with the life you want, and the good news is that you don’t have to. It’s time to take back your life. Fix your schedule to create space. This much-needed time is what will get you to the next stage: ideas. I don’t want you to find this space only for the sake of clearing out the mental clutter that bogs us all down. I want you to find more time before you begin moving, to allow you to tinker with ideas in the next stage. Having time not only allows you to think about what is ahead, but also frees you up long enough to really engage with your thoughts, put them under the microscope, and then test them out. If you’re having a problem with thinking of new ideas, your issue is probably not a lack of imagination; busyness is what’s keeping you rushed and clouding your mind. Without rest, meditation, and free thinking, you will continue using the crutch of playing it “busy” and safe for far too long. Learning to fight busyness should be your number one priority. How do you do this? By focusing on what you want and need to accomplish. When you know what your top priorities are, you don’t have to wonder what needs less attention, because you have already streamlined your life to focus on what matters most to you. Prioritizing brings clarity and direction. When you take on anything and everything, life quickly becomes chaotic. You can’t possibly do everything and still do it well. But when you decide what you need to pour your heart into, you allow yourself to be more creative in those areas and can make a bigger impact with your life’s work. Now, grab a notebook and take ten minutes to write down your current priorities before you begin this journey. You will need this notebook for later exercises as well so keep it close by. (If you already know your priorities, use this prompt as a reminder.) Now that you’re finished writing your priorities down, take a look at your findings. Are you happy or unhappy with your results? If you’re unhappy with your priorities, the good news is that you can now make changes as you see fit. But don’t wait to remove what doesn’t move you toward your goals. Make a phone call if you need to make a phone call to free up more time. Send an e-mail if you need to send an e-mail. Schedule a meeting if you need to schedule a meeting. Whomever you need to talk to and whatever you need to do to create more time in your day, do it right now. This book is pointless unless you take action to improve your life. Place a bookmark here and continue reading once you eliminate the unnecessary. Now that you have your focused priorities, you can add more things back into your schedule. But as you add these commitments back in, you will now be more aware of your unique purpose. This step is so important because when you take the time to tweak your life to hold only what is near and dear to your heart, you become optimistic and more effective with your efforts. Great things happen when there is time to mold our ideas into better ones, and that only happens when we give the process of finding solutions more of our time. Rushing creativity leads only to basic, surface thoughts, but when we have time to ponder our ideas, we get to push through and dig deeper to find the best possible answers to our biggest questions. Prioritizing helps us commit to what is important and lowers our unnecessary stress levels. Overwhelming stress is not helpful, but the kind of stress that moves us out of our comfort zone is not necessarily a bad thing. Stress is sometimes the little push we need to get things done, but again we need to make sure that the stress we are feeling is only being directed toward what is important enough to pursue further. As each of us figures out our priorities, it’s important to consider the season of life we are in. Not all life seasons are the same. Some are busier and some are slower, and it is your job to be aware of the season you are in and still affect the world in the midst of it. If it is a busy time in life, then your impact probably won’t be as big. If you find yourself with tons of freedom, though, it’s time to get to work. As I write this, my wife and I have two young children. I own two businesses and am involved in various community projects. But if you were to ask my wife how our marriage is, she would say it is the best it has ever been. How is this? I have learned how to manage time well. But if it were the old me, I would probably have to let go of the community involvement at least. It’s about knowing your season, seeing your limits, being realistic with your time, and prioritizing what is truly important. When I began the process of stepping out and deciding to not play life safe, did I bite off more than I could chew at some points? Did the pursuit of bravery and moving ahead sometimes cause me to commit to too many things? I have to answer yes, but it was because my focus wasn’t on priorities. I kept agreeing to do more without looking at what was truly valuable. Again, to move from playing it safe your priorities need to be aligned to free up time so you can take on bigger and better things. And if you ever feel like you don’t have enough time for your priorities and everything else in life, just remember the story of the mayonnaise jar and two cups of coffee. 5,0 de 5 estrelasLife-changing Read! Thank you, Adam Kirk Smith for the message in your book "The Bravest You". It has changed my husband's and my lives. In just one example (because there are many), he and I are beginning a much needed better health journey. Because of the motivation found on these pages, we are making this journey together while fighting fears, as well as growing in focus and self-care - another word for self-discipline. As NYT best-selling author Jon Acuff said, "...The Bravest You dares you to live differently. You're the only you we've got; learn how to love that truth with this book." We whole-heartedly agree! To become the best ever in all areas of your life, purchase it now - you won't regret it! This book is extremely helpful if you need actionable steps to be more courageous. His writing is inspiring and you get practical advice from him. One of the best books to find your passion and live a more extraordinary life! 5,0 de 5 estrelasGood read!! 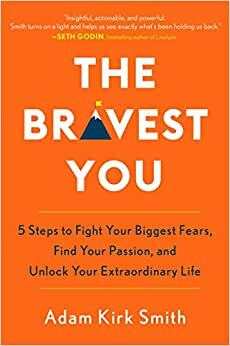 The Bravest you is inspiring book for those who keep themselves locked in unknown fears, and cannot take steps to achieve their simple or fancy goals. Adam describes how one can take different steps to fight different kind of fears which holding back a person to make life changing decision. This book generally helpful to see your inner conscious clearly and what to do, to avoid any fear which is not letting you move forward. Love it....Thank you for writing it! Great book! I needed the challenge, not to run away from fear, but run towards my passions. Thank you!